Toward the end of June, the U.S. Supreme Court unanimously ruled that "no-protest" zones around abortion clinics in Massachusetts were unconstitutional infringements of free speech (McCullen v. Coakley). Last week in Raleigh, Wake County District Court Judge Joyce Hamilton referenced McCullen v. Coakley in dismissing trespassing charges against five Moral Monday protesters. 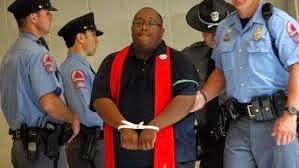 Hamilton was appointed to hear hundreds of the charges against Moral Monday protesters who occupied the NC General Assembly building throughout last summer. Judge Hamilton also indicated that she may have ruled incorrectly in other cases of Moral Monday protesters that have already been heard. Some of those protesters were fined. Hamilton is expected to issue an order this week that may have sweeping implications for all Moral Monday protesters who were arrested and prosecuted last year, over 900 in total. "In trying to compare the actions in North Carolina to the Massachusetts case, defense attorneys contend the [General Assembly police] chief let demonstrators come into a zone inside the Legislative Building and exercise free speech and then declared the area a no-speech zone. "Such action violates free speech rights, the attorneys argued in trial after trial before the U.S. justices issued their ruling."